The Trattore oil set from NOVA68 includes a stainless steel structure, two Etruscan green 250ml glass bottles, two stainless steel pourers and two stoneware bowls with lids. Andrea Branzi's oil set holds up to four small taster bottles (two are included), with optional compartments for other condiments like mustard and capers. 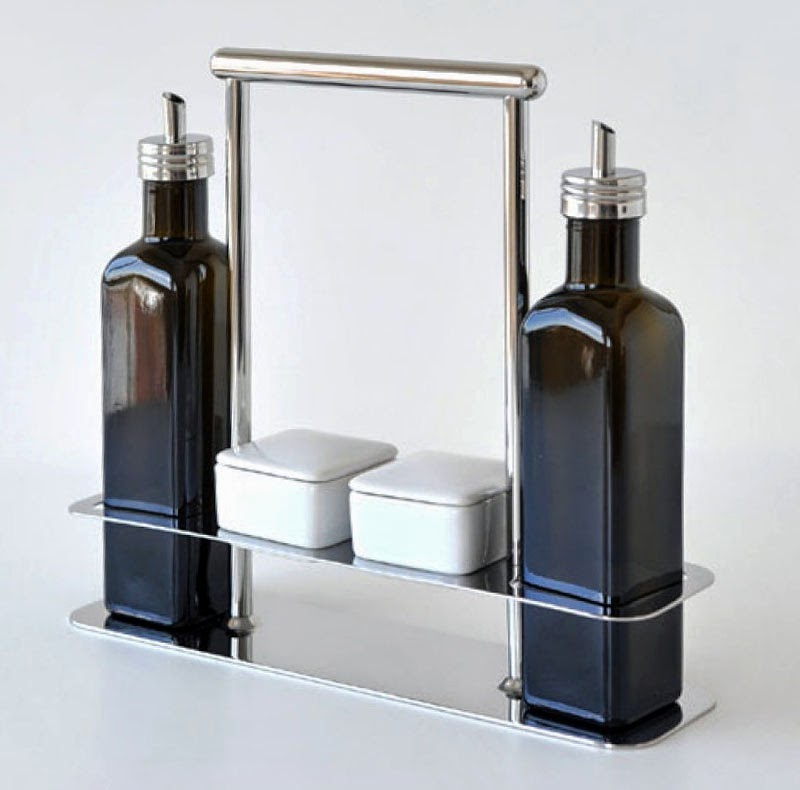 the base of the set and the oil bottles' pouring caps are 18/10 stainless steel, with two central stoneware containers and two glass bottles approved by the consortium for the protection of Chianti Classico olive oil in Italy. This stunning centerpiece makes an excellent gift for the oil connoisseur or simply those wanting to explore the health and gastronomic benefits of this marvelous condiment. These Italian stylish glass oil and vinegar bottles with attractive design and stainless steel pourers make a great gift. Comes packaged in a nice Alessi box suitable for gift giving. Dimensions: 11.5"w x 10.25"h x 2.75"d.